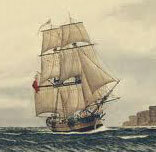 In 1790, the colonists at Port Jackson faced their harshest conditions. Early attempts at agriculture had produced little. While hunting and fishing did supplement meagre supplies, starvation was a real possibility. Rations were reduced by two thirds, the weekly allowance per person being 2 lb (1 kilogram) of pork, 2.5 lb (1.2 kilograms) of flour and 2 lb (1 kilogram) of rice. In March some provisions arrived on HMS Supply but the arrival of the Second Fleet in June made the situation worse. Known as the Death Fleet, these convict ships were owned by private contractor. Those convicts that hadn’t died on board as a result of starvation and ill-treatment arrived in very poor health and were a drain on resources, worsening the 1790 food crisis. Pork 23,851lb will last until 26 August at current rates of consumption. From 1791, the more regular arrival of boats alleviated the acute shortage of food, while farming gradually improved thanks to the efforts of emancipated convicts, former soldiers and, eventually, free settlers.